Though some ambitious paddlers have traveled the river from its source to the ocean, this great recreational resource offers a number of day trips ideal for even the novice canoer. 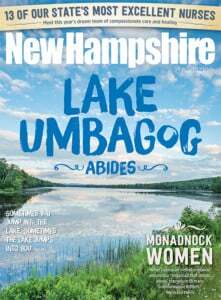 The White Mountains, more than 900 lakes and an Atlantic shoreline tend to overshadow one of New Hampshire’s remarkable recreational resources: the Connecticut River. Many stretches of the river provide excellent paddling, fishing, bird watching, camping and swimming. And the Connecticut River Byway takes you to nearby villages, museums, historic sites, hiking trails and other places of interest. Although some hardy souls may want to take on the river from source to sea, as I did recently, fulfilling a lifelong dream, there are many day trips that combine well with sightseeing in each area. Plenty of inns, B&Bs and restaurants provide comfort to non-campers, and there are a few places where you can rent if you don’t own a boat [see sidebar below]. The 13-mile stretch of river from Wells River-Woodsville to Haverhill, NH, is a good place to begin. Some swift water gets you moving but soon flattens out and it’s peaceful paddling down to the takeout at Bedell Bridge State Park. Fishing and bird watching are popular here as the current takes you through two oxbows, described by 19th-century traveler Timothy Dwight as “romantic meanders.” Although the scenery is not spectacular — mostly woods and farmland — we were rewarded when we spotted a family of otters playing in the mud. Although the river here is placid, your downstream journey retraces the perilous one of Captain Robert Rogers, a hero of the French and Indian Wars. Rogers was ordered to attack an Abenaki village at St. Francis is an infamous raid in 1759. Fleeing south, pursued by the enemy, Rogers and his men failed to connect with their rescue party at Woodsville so they took to the river. The raging currents destroyed their raft and they swam for their lives in the icy water. Though lacking tools, they built another raft and, after a narrow escape at Sumner Falls, they finally reached the Fort at #4 at Charlestown where they sent canoes upriver to rescue the surviving Rangers. Only 92 of the 141 men who took part in that shameful raid returned. The Fort at No. 4, incidentally, is now an authentically reconstructed settlement. It’s well worth a visit if you continue downstream. The takeout at the end of this reach at Bedell Bridge is a reminder of the ravages of the river’s frequent flooding. The bridge, first built in 1805, is no longer there, but the stone abutments are still visible. Severe flooding destroyed several replacements. On July 4, 1866, a sudden storm caused picnickers to rush onto the covered bridge for shelter. A strong gust then blew the bridge off its foundation; it landed on its side in the shallow water. Fortunately, there were no injuries. A fifth bridge, erected in 1866, for years provided an excellent site for viewing the log runs but has since disappeared. Fort at No. 4, at Charlestown, NH, recreates the life of an 18th-century English settlement along the banks of the Connecticut River. Originally settled in 1740, the fort was the northernmost English outpost during the French and Indian War. The nearest settlements were Fort Dummer, near Brattleboro, Vt., and Deerfield, Mass. The area surrounding the river here is especially rewarding to explore. Wells River, Vt., and Woodsville, NH, still retain their old-time flavor as logging towns, and there are picturesque towns and villages on both sides of the river: Newbury, Bradford, Fairlee and the Thetfords in Vermont, and Haverhill and Lyme in New Hampshire. The Newbury Historic District is particularly noteworthy. A walking tour there will take you past a number of splendid houses dating from 1790 that include examples of Greek Revival, Federal-style, later Victorian styles and Colonial Revival. This district is a remarkable concentration of early 19th-century architecture in a traditional New England village. This classic bridge between Fairlee, Vt., and Orford, NH, was recently rebuilt. Peregrine falcons nest in the Palisades at Fairlee, on the right. At this site in 1793 Captain Samuel Morley of Orford first demonstrated the use of steam-powered navigation on the Connecticut River. Through a friend, the idea was shown to Robert Fulton, who built on it and most likely owes Morley much of the credit for the success he gained. Orford features a ridge of seven historic estate homes, including Morley’s along its main highway. Another enjoyable day trip begins in Haverhill and ends at Orford (16 miles). It’s a peaceful, rural stretch, with many opportunities for fishing. With luck you may spot peregrine falcons near their nesting sites at Sawyers Ledge or the Palisades, granite cliffs at Fairlee. Although the falcons are said to dive at 200 mph, those we saw were lazily gliding about overhead. We also spotted mallards, Canada geese and other waterfowl. The slow current takes you past three campsites, good places to eat lunch even if you don’t plan to stay overnight. The takeout is just below Morey Memorial Bridge, which honors Samuel Morey, whom many consider the inventor of the steamboat. Your downstream journey crosses Morey’s historic test run across the river. River otters, ducks and mallards, great blue herons, Canada geese and other water birds, ospreys, bald eagles, loons and one large turtle. Morey built the steam-powered Aunt Sally and in 1790 tested it on a run from Orford to Fairlee, achieving a speed of four miles per hour. He later conferred with Robert Fulton and had his design incorporated — some say stolen — into Fulton’s successful vessel, the Clermont. Morey built a much-improved steamboat in which he chugged 160 miles up the river to Hartford, Conn., the first long-distance trip by steamboat in the United States. Frustrated by his failure to profit from his invention, however, he scuttled the Aunt Sally in Fairlee Pond, later renamed Lake Morey in his honor. One wonders whether this historic relic is still resting in the deep. Even though Morey’s steamboat did not bring him the acclaim he deserved, he had many significant achievements. He played a major role in creating the town’s architectural marvel, the Ridge Houses. Morey bought the Obadiah Noble House (1773), the first of the seven Federal-style houses on the ridge overlooking the river. They were dubbed “Bulfinch Row,” a misnomer since early American architect Charles Bulfinch did not participate, though his associate Asher Benjamin may have designed the Wheeler House in 1816. Local craftsmen designed and built the rest. It’s well worth the effort to beach your boat and take a walk through Orford to see the Ridge Houses on Main Street. Washington Irving wrote, “In all my travels in this country and Europe, I have never seen any village more beautiful than this.” The image stays in your memory long after you’ve left the river. Should you continue your downstream journey south of the Massachusetts border, you’ll also retrace the voyage of the Barnet. In 1826 the Connecticut River Company built a sternwheel steamship 75 feet long and 14 ½ feet wide, drawing only 22 inches of water. In a fit of optimism they named it after the Vermont town they hoped to reach, about 10 river miles north of Wells River. It is just south of what was then an insurmountable barrier, Fifteen Mile Falls. Despite this humiliation, the Barnet returned to Hartford amid cannon fire and jubilation. Three years later she was among the first boats to steam through Windsor Locks Canal, bypassing the notorious Enfield Rapids. In 1827 she burst her boiler, ending her days on the river. remotely controls the turbines at Bellows Falls and Vernon. The section from Ompompanoosuc River to Wilder Dam (9½ miles) is another good choice for a short day’s paddle. Although the guidebook warns of motorboats, kayaks, canoes, rowing sculls and shells, we encountered few other boaters. One was a somewhat prickly female sculler who chided us for being on the wrong side of the river for downstream travel. The ducks, loons and a lone otter we spotted were more welcoming. Dartmouth College dominates this part of the river. Paddlers pass under the Ledyard Bridge and can take out at the Ledyard Canoe Club to explore the surrounding area. The possibilities include the Montshire Museum of Science in Norwich, a walk around Hanover and the beautiful Dartmouth campus and a visit to the Hood Museum of Art. An indispensable guide for recreational boating on the river is “The Connecticut River Boating Guide” by John and Wendy Sinton and Elizabeth Farnsworth (2007). It provides essential information about access, campgrounds, river conditions, wildlife and much more. The book covers the entire river from the Connecticut Lakes to Long Island Sound. Also useful is the “Connecticut River Byway Map and Guide,” available at the Waypoint Welcome Centers and at ctrivertravel.net. Paddlers passing under the Ledyard Bridge may spot hikers making their way north to Mount Katahdin in Maine, endpoint of the Appalachian Trail. The bridge commemorates John Ledyard, one of Dartmouth’s most famous dropouts. Soon after entering college, he felled a giant white pine and crafted his own dugout canoe, 50 feet long and 3 feet wide. Tossing in some smoked venison and a bearskin robe, he headed down the river, paddling 140 miles through falls and dangerous rapids to Hartford, Conn. He brought along a Greek New Testament and a volume of Ovid, which he was apparently reading when he was almost swept over the falls at Bellows Falls. At New London he shipped out as a common seaman, beginning an adventurous career that included travel in Europe, Asia and Africa. After suffering great hardships in Siberia, he accepted the African Association’s proposal that he make a journey by caravan to explore the African interior. Ledyard hastened to Cairo and was preparing for this adventure when he suffered from a “bilious complaint.” He died of an overdose of vitriolic (sulfuric) acid, apparently a standard remedy for stomach pains at the time. He was 38. Every spring a group of Dartmouth students re-enact Ledyard’s voyage, paddling down the river from Hanover to Hartford. It’s unlikely they are reading Ovid, even in translation. For the day tripper, this reach ends at Wilder Dam. Many have died here, and you can visit the grave of Charles A. Barber, a 19-year-old logger who drowned in the rapids during a log run in 1895. His father came down from Cherryfield, Maine, claimed his son’s wages ($300) and went home, leaving the body behind. Charles’s logger comrades buried him here. Here Rogers and his men again barely escaped death and the destruction of their raft. At that time — 1759 — these rapids were known as Wattockquitchey Falls. After putting in just below the falls, boaters have several miles of smooth sailing before reaching the Cornish Boat Landing. There are spectacular views of Mt. Ascutney, on the Vermont side, and of the Windsor-Cornish Bridge. There are attractions both on and off the river as it flows through woods and farmland. We saw loons, bald eagles, great blue herons, and perhaps most extraordinary, a small plane towing a hang glider. One worthwhile side trip is to the American Precision Museum, located in the Robbins and Lawrence Armory in Windsor. It has the largest collection of historically significant machine tools in the United States, including lathes, shapers, planers, milling machines and machines developed to produce firearms with interchangeable parts. Windsor is well worth a leisurely stroll. Its sights include Old Constitution House, Windsor House (not open to the public) and Old South Church, the masterpiece of the American architect Asher Benjamin. Also nearby are Paradise Park and Mt. Ascutney State Park. Undoubtedly the major attraction near this stretch of the river is the Saint-Gaudens National Historical Site in Cornish. Here visitors can see the home, gardens and studios of the renowned sculptor Augustus Saint-Gaudens. The large brick house was originally an inn or tavern; Saint-Gaudens made extensive additions and improvements when it became his summer residence. The gardens where one can now walk and picnic were once pastures for sheep. *Editor's note: Click here for our guide to visiting the Saint-Gaudens National Historical Site written by George Kelly. Saint-Gaudens entertained many fellow artists at his home; probably the best known was Maxfield Parrish, a commercial artist and illustrator. This group became known as the Cornish Art Colony. Parrish’s house, The Oaks, is nearby, as is the site of Woodrow Wilson’s summer White House in 1914 and 1915. Home and studio of sculptor Augustus Saint-Gaudens, a National Historic Site that displays his life and work. He is best known for heroic monuments, public portrait reliefs and his designs for some classic US gold coins. Exhibits and gardens are open from Memorial Day weekend to Oct. 31 each season. Saint-Gaudens attracted many other artists to the area, which became known as the Cornish Art Colony. This day’s trip ends at one of the most striking and photogenic sights that the paddler encounters while traveling south — the Cornish-Windsor Bridge, the longest covered bridge in the United States. Especially with Mt. Ascutney in the background, it has achieved iconic status. The Connecticut River is surely among New Hampshire’s treasures. Beautiful scenery, abundant wildlife, pleasant paddling and unforeseen adventures are all there, awaiting those who push off from its shores. Stand up paddleboarding (SUP) is a perfect way to interact with the relatively calm waters of the Upper Connecticut. A dreamy SUP trip below Moore Dam, down the Connecticut River to Comerford Dam, is a way to build powerful core strength, observe countless bald eagles and get away from highway traffic and beeping phones, says Matt Keating of Badass Outdoors, a Littleton-based supplier of adventure gear. “The Northeast has so many brilliant waterways, it’s a wonder to me that every vehicle around isn’t sporting a boat on its roof!” says Keating, adding that the boards are lightweight (around 18-28 pounds), easy to load and strap to a basic roof rack, and require minimal gear and experience to enjoy. He says the standing position improves the view, as well. The Upper Connecticut actually is all ours. For almost a century the Connecticut River figured in boundary disputes between Vermont and New Hampshire. King George III of England had established the border between Vermont and New Hampshire in 1764, and in 1935 the US Supreme Court re-affirmed King George’s boundary as “the low-water mark on the Vermont side of the river.” Technically, this means that the river belongs to New Hampshire. Running 410 miles from Canada to the Long Island Sound, the Connecticut is the longest river in New England.